FastPictureViewer | View topic - Highlight clipping warning? I discovered FPV2 and I am really amazed by the quality of this program. As I am doing quite a lot of landscape pictures, the ability to view the result on a bigger screen is a real plus. But I am missing a functionnality that I use a lot: Highlight clipping warning. 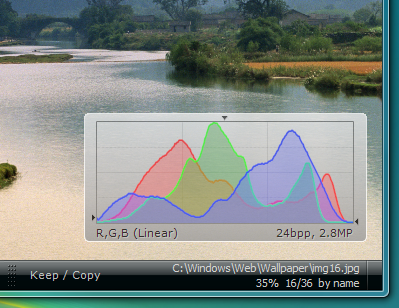 Is it implemented somewhere (behind the histogram?)? There is no such indicator at this time but this feature is considered for possible addition in a future version of FPV Pro. Yes, the tiny arrows at the left and right sides shows the highest channel value on the dark, respectively bright sides. Another little known feature is the tiny vertical arrow at the top of the histogram frame, which indicates the average luminance of the image. You'll find out that most "properly exposed" images have their average luminance in the middle tier of the range (of course this is simply an average and high-contrast images, such as rays of light on an otherwise dark image, will not follow this rule). mid-scale average luminance, typical of well-exposed natural light scenes. 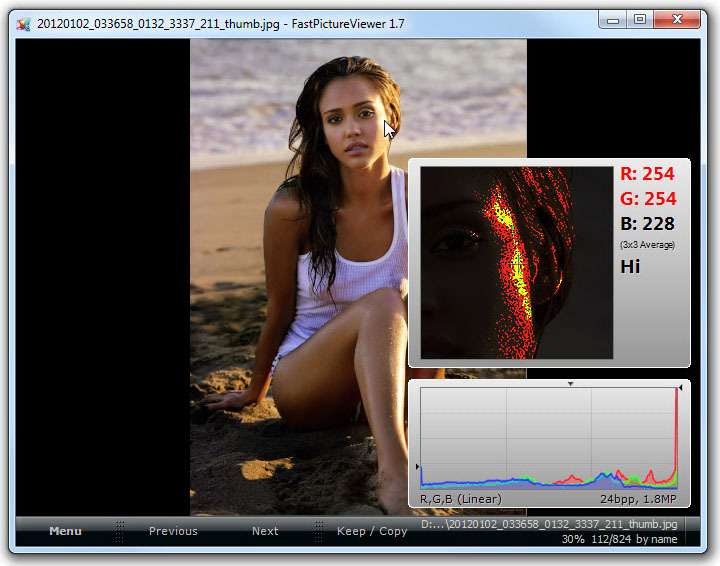 A lost shadows / burned highlights indicator (as well as an RGB eyedropper and 1:1 preview window) has been added to FastPictureViewer Pro. Just hit the Z key and explore the floating window's context menu: you can select between 100% preview, shadows, highlights and also link the histogram (to get a partial histogram of the region near the mouse cursor).